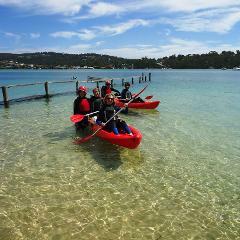 Explore the stunning estuaries and coastline of Merimbula Bay with our experienced local guides. 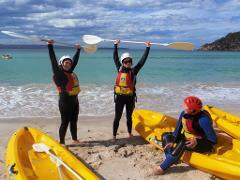 This is suitable for beginner to intermediate kayakers. Snorkeling and wave riding are included for the more adventurous participants. This half day tour is a great adventure for families and others looking to explore the peaceful waters of the Bega River. Our friendly knowledgeable leaders will guide you from Mogareeka to Black Fellows Lagoon. 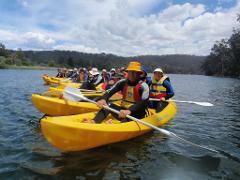 A great way to learn the basics and then enjoy the freedom of Kayaking on Merimbula Lake. 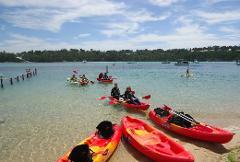 A great way to learn the basics and then enjoy the freedom of Kayaking with a friend on Merimbula Lake. Comfortable double kayak with comfortable padded seats - can accommodate a "small" 3rd person.